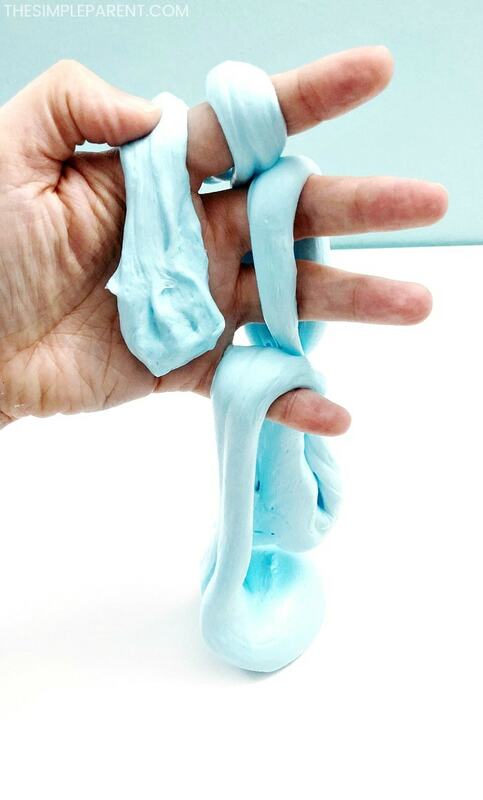 Home » Crafts & DIY » Make Blue Fluffy Slime with this Fool-Proof Recipe! Ready to learn how to make easy slime? Blue fluffy slime is almost fool-proof! So your kids want to make slime but you’re feeling intimidated? Fluffy slime is one of the easiest ways to make slime! It’s one of the most fool-proof ways to make slime that’s out there! It’s also borax-free! 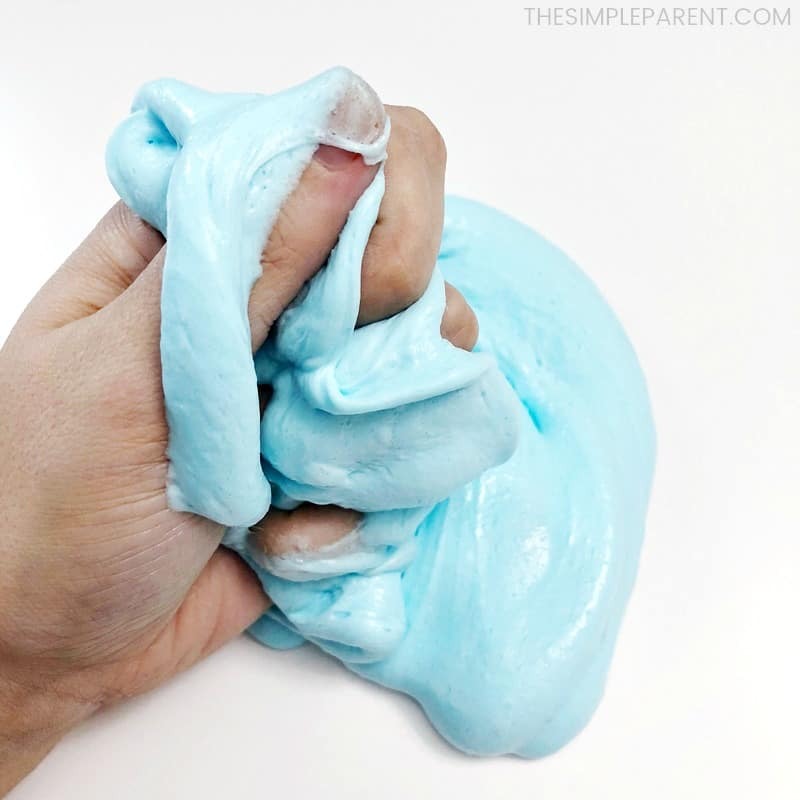 Check out just how easy it is to make this easy blue fluffy slime! There seem to be a million different ways to make DIY slime and we’ve tried a bunch of them. Some of them have worked well for us while others have been less than successful. We’ve made green glitter slime in the past with success but I’ve been looking for away to skip the borax. Easy fluffy slime is a great alternative and it really is about as simple as it gets. 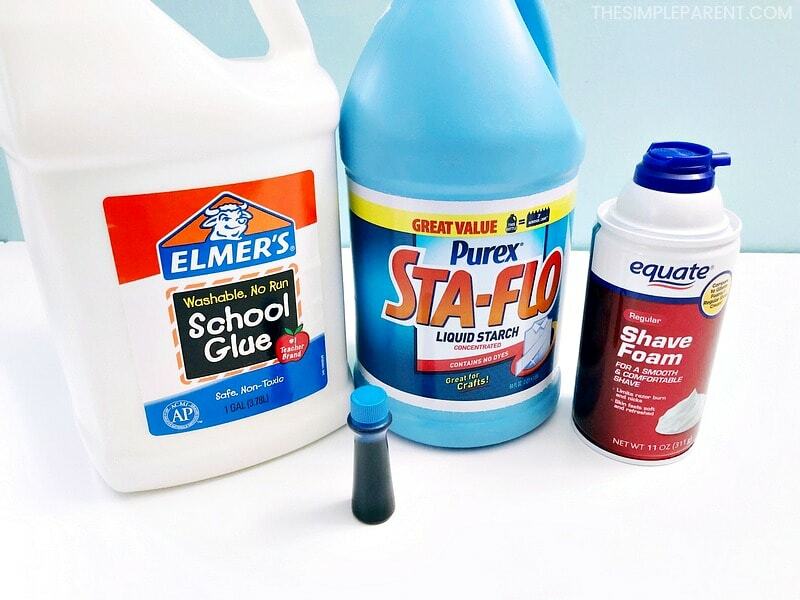 To make the blue fluffy slime, you’ll need some basic slime ingredients. 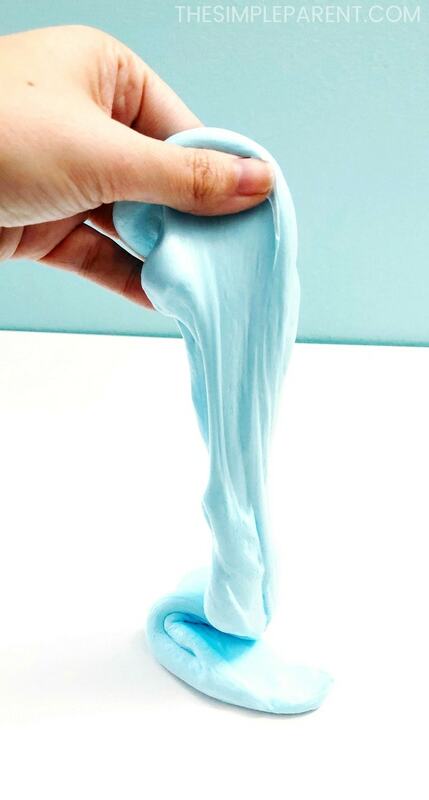 For this blue slime recipe, you’ll need white glue, liquid starch, shaving cream, and food coloring. 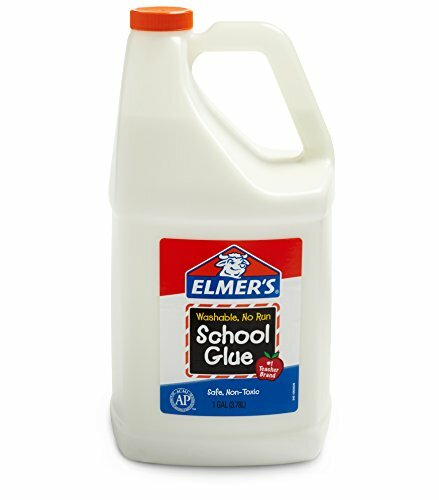 We opt to order a gallon of Elmer’s glue because I don’t have to worry about being prepared to make slime. Plus, it’s easier to pour than squeezing little bottles of glue. But you can stock up on bottles of glue too! No matter how you decide to get your materials, you’ll need these basics to make the best fluffy slime! 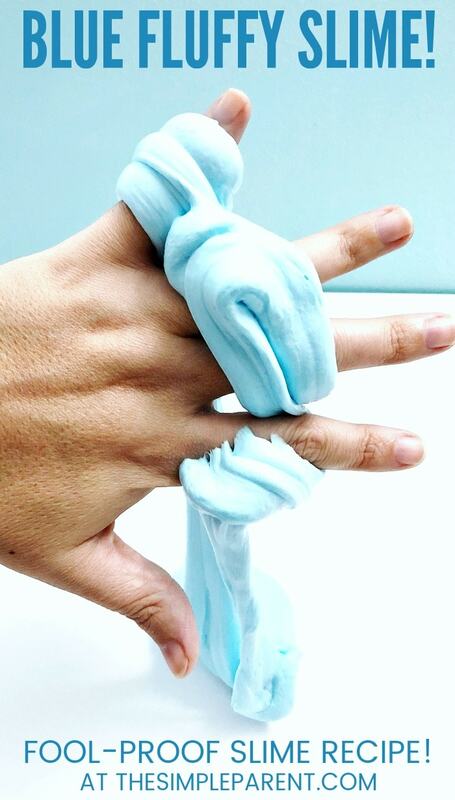 The key to making this blue fluffy slime is the shaving cream. It works best with the basic shaving cream. The cheap shaving cream is the key to making this slime fluffy! 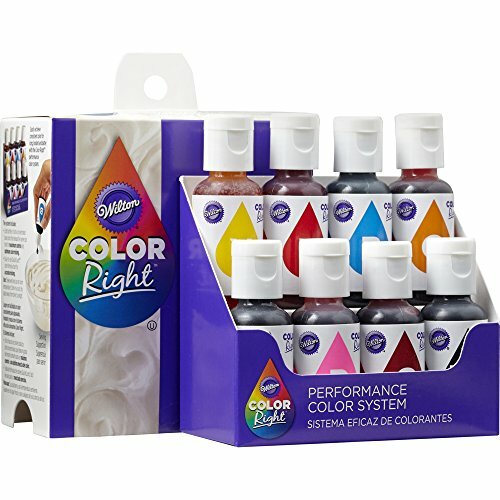 The food coloring is optional too but if you don’t color the slime you’ll end up with white slime and not blue slime (or the color you choose to make)! If you want to add sparkle or color to your slime, you can also add glitter, nonpareil sprinkles or even themed sprinkles! Once you’ve got everything you need to make stretchy fluffy slime, you’re ready to get started! Before you get started, I do want to mention safety. This is a no borax slime recipe but it does use liquid starch. When we’re making liquid starch slime, it’s all about adult supervision. It’s also important to clean everything up well when you’re done playing with the blue fluffy slime. I always disinfect every surface we use as well as anything I use to mix up the slime (bowls, spoons, spatulas, etc). And we all wash our hands well after playing with slime! You can tweak the amounts of the ingredients that you use depending on how much easy fluffy slime you want to make. These measurements make a good batch of slime for one kid to play with. Basically, you’ll get a bit more slime than the amount of glue you use (because the shaving cream will add a bit more to it). We usually use equal parts glue and shaving cream. STEP 1. Pour the glue into a bowl. STEP 2. Add the shaving cream. STEP 3. Add a few drops of food coloring and mix together. If you want to add any extras like glitter, sprinkle it in now and mix into your batch of slime! STEP 4. Add the liquid starch and mix with spoon or spatula. This is the one step where things can go wrong! Go easy on the liquid starch. You don’t want to add too much! Add your liquid starch one tablespoon at a time. Start with one tablespoon and stir. The slime will start to form quickly. If you add too much liquid starch to start, your slime will get too hard. So start with one tablespoon and add more if needed (after you knead your slime, if it’s still too sticky, you might add a bit more). STEP 5. 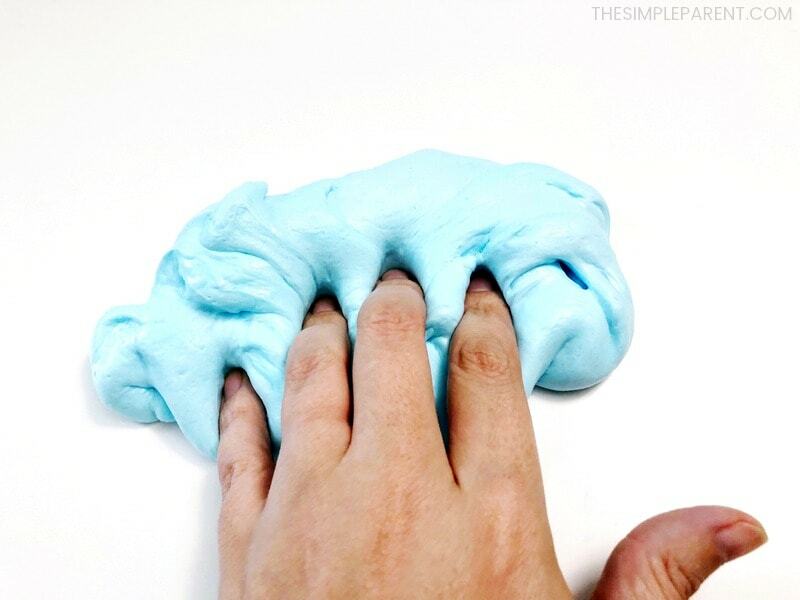 Knead slime until it doesn’t stick to your fingers anymore. Knead the slime for a few minutes and it the stickiness will start to go away. 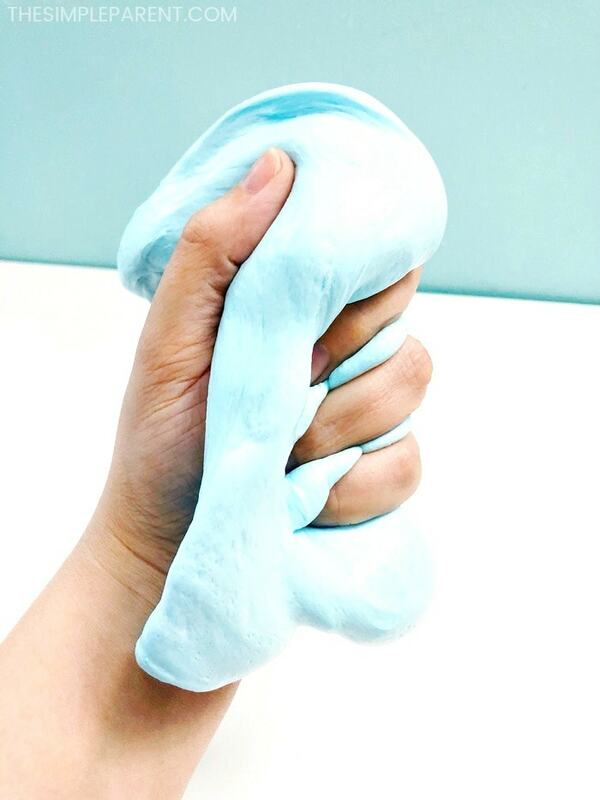 If you’ve kneaded your blue fluffy slime for a few minutes and it’s still sticking to your hands, you can add a bit more starch. It’s easier to add more starch to the mix as you go if needed. You can also try this with clear glue or glitter glue. But with fluffy slime, the shaving cream turns it white anyway so we usually just use the white school glue! If you want an easy way to make a glitter slime, check out this recipe! Or learn how to make slime with soap (this slime can really slime things)!